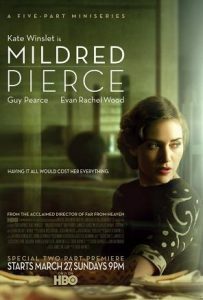 Mildred Pierce is an engrossing deconstruction of American society. Much as Raymond Chandler portrays the dark, seamy side with classic noir tropes, Cain does the same with a more intimate, domestic setting and characters. Mildred is both admirable and pitiable, a tragic heroine who is brave, strong and resolute, but at the same time needy, vulnerable and devious. We are drawn into this world of noir-ish characters, where the brutal and crass side of the American dream is ruthlessly exposed in all its ugliness. Mildred’s daughter Veda is a masterful creation of brutal narcissism, playing a type of femme-fatale role, though unusually, playing off her mother rather than a male character. This creates extraordinary tension, drama and poignancy. Veda is her mother’s equal as a complex and contradictory character and surprisingly she at times warrants reader sympathy as we see her exploit and be exploited by a society utterly lacking in morals. Mildred Pierce is not an easy read. It is very intense and psychologically confronting. But it is fascinating and rewarding and a great place to begin to explore Cain’s oeuvre. Being a prolific and high ranking Amazon Reviewer also subjects you to negative responses. Some of my best reviews have been received unfavourably, because some people don’t understand the purpose of a review. As social media platforms have democratised the written word anyone can put forward their point of view not matter how ridiculous, inaccurate of poorly expressed it is.